Happy 7th Anniversary Polyamory Toronto! Happy 7th Anniversary to the wonderful folks of our community! We are fresh off the heels of our anniversary party last night so I am a tired bear. We decided to try combining our anniversary party with our monthly pub night social and we all agree it was a pretty spectacular combo. It definitely felt like Pub Night Plus! There are so many people to thank. Reflecting back on the magic of 7 years of organizing, collaborating and co-creating, we celebrate the effort of hundreds of people. The making of 7 years of community is not without its ups and downs, ebbs and flows. As I looked around the room when making announcements last night, I was compelled with thoughts of all the people who were absent from the room. We’ve seen literally thousands of people come through our community. Some have passed through looking for and finding understanding and then moved along. Some have found their people and are now too saturated and stretched for community engagement; energy limitations be damned! But I can’t possibly forget the people who aren’t in the room because they don’t have access to our community, for various reasons like poverty, illness and disability, living in remote locations, just to name a few. I think about those people all the time because isolation is dangerous beast. The internet has opened up so many ways for us to connect but it can also magnify all the ways our current situations limit us. FOMO (fear of missing out) isn’t just an edgy acronym; for many it’s a very real state of existence. I think about this at every single event I host and attend. Over the past number of years, we’ve spent significant time and effort thinking of ways to increase access to our community and reach those that need us the most. If you have ideas in this area, let’s chat more! As we move forward in 2018, we have a lot of fun and excitement planned, in addition to much needed changes. I am on the tail end of finishing up new Member Expectations that will replace our current Safer Space Guidelines. This change has been a year and a half in the making and has been the hard, collaborative work of some fine folks. Please keep an eye out in your email in the next couple of weeks/month for that announcement. I’ve had the pleasure of leading the facilitation of our monthly discussion for just over 5 years now and it’s been one of the most rewarding things I’ve done. But there is a piece of support that is missing in our community. While the Chat and Learns are a great space to talk about topics in bigger, more meta ways, they don’t leave space to unpack the personal with the support of community. That’s why we’re excited to introduce a Polyam Peer Support event in the coming weeks. It’ll create a much-needed space for those of us that value the community feel of connection and encouragement. We have a wonderful line up of facilitators that we’ll be rotating through month to month to better balance the work needed to sustain this type of event. We’re so excited to be launching this! Our anniversary also poignantly aligns with International Women’s Day. It would be remiss of me to not acknowledge the strong voices of women, not only from our local community and the greater polyam community, but also women in general, doing the work needed to break down the problematic systems we’re marinating in. When I ponder what International Women’s Day means to me these days, I find myself thinking about all the ways we’re othered, the ways society and government bodies sort us into binary categories. The way power is doled out and accessed. I don’t exist in a binary world and so I ponder both the depth and shallowness of the definition of woman, and what womanhood means. How it is always pinned opposite man, and manliness. But genders don’t exist in absolutes and opposites. So, on this International Women’s Day, I ask you to also ponder what womanhood means to you and how you can contribute to a more inclusive view of the unique qualities we all bring to the table. To all you fellow gender diverse humans, I see you and there can also be room for us to celebrate and be recognized today. I could fill these pages with lists of women and femmes who have inspired me over the years but this year I promised I would learn the art of being concise (clearly, it’s a work in progress!) so I’ll include links to the work of three people I encourage you to explore. Kim Tallbear has written on the topics of polyamory and decolonizing love at The Critical Polyamorist since 2013. I urge you to search through the various categories on the site which include Christianity & Polyamory, Colonialism & Polyamory, Critical Theory, Family & Polyamory, Indigenous People & Polyamory, Native Americans & Polyamory, Paganism & Polyamory, Professionalism & Polyamory, Race & Polyamory, and Tipi Confessions. Kim’s voice is grounded in anti-oppression work that I strongly value. From our very own community, Alicia Bunyan-Sampson writes about dating in Toronto at Diary of a Polyamorous Black Girl. From the site: “Diary Of A Polyamorous Black Girl was created to inspire other black polyamorous woman to speak their truth and build community.” We are honoured to have Alicia join us in community engagement and we’re looking forward to building a relationship with her to create events that feature her work. Thank you, Alicia! And lastly, the art and poetry of Ijeoma Umebinyuo will inspire and move you in ways you never dreamed. Her sometimes simple words have powerful impact and she weaves a breathtaking brilliance into her use of words as expression. Follow the work of these three amazing women. Buy their work. Share their words. Embody the energy that learning from others can spark. So now I ask you all, who inspires you? How has your life changed by this person? How do you honour their impact? How are you looking to show up in our community in 2018 and bring this inspiration with you? We’re so very happy to have you all! On behalf of organizers and event hosts, both past and present, cheers to another profound year of community building, side by side! It is very important to us that we promote inclusive events. There is a large spectrum of gender and sexual identities. There are complexities regarding how people date and relate across and among these lines. The Poly Speed Dating form therefore avoids asking for self-identification altogether! An important note of clarification is that some trans people will want to filter out anyone not accepting of their trans identity, and so enjoy having multiple categories. At the same time, other trans people may prefer to identify simply as men or women as they feel that they should not have to identify themselves as trans in any particular way. This is also fine and a reason for the multiple categories. To be clear: we have these boxes because many people have expressed a desire to have them. It is a tool to help people navigate speed dating in a way that feels comfortable, safe, and worthwhile. It is important to state that this event is no different from any other event we have hosted and our Safer Space and Member Behaviour Guidelines will be in effect. With regards to gender, you have to answer two questions in two columns. The first column is a preference question on whom you are looking for. The second column is a minimal requirements question about whom your dates should be looking for. The first column is pretty simple. Click off all the identities you’re interested in dating. One check means willing, two checks means preferred. That’s that! In general, checking off more categories in the first column gets a person more dates. Each gender identity in the first column has two checkboxes. If you check off one of the checkboxes, it means that you are open to dating someone of that gender. If you check off both checkboxes, it means that you prefer to date someone in that category. The matching algorithm will score those matches higher and you will be more likely to get them. This can be used to set up situations with a preferred set of genders and an alternative set of genders. The second column is where things get a little more confusing. This is what you want a potential match to be open to. Usually, what you want your dates to be looking for is… you! For example, men will click the box that says their dates should be looking for men. It can be as simple as that. In general, checking off fewer categories in the second column gets a person more dates. However, you can also require your dates to be open to additional genders as well. The system gauges whether others would be interested in you based on your preferences. When this works out both ways, we have a match. We phrase this second question in a roundabout manner because we want to get away from questions of personal identity. We instead allow people to say what is important to them in terms of what their matches are open to. You will never be matched with people who have checked off a category in the second column that you are not looking for. Don’t say you are open to something unless you actually are! It is not fun for people to go on dates with people clearly not interested in them. This is no intersex gender category. Intersex folks may identify as one or multiple genders, and we hope the form accurately covers these multiple gender choices. We feel that the important thing to focus on for Poly Speed Dating purposes is what gender identities people are open to, which is why we have not made intersex a category choice. Q: What happens if I check off lots of boxes for the first question? A: The more categories you check off, the more types of people you meet. Even if you check off all rows, most of your dates will only fit one or two categories. Q: Why doesn’t the second column just say “check off what you are”? A: It used to, and that is still what most people do. This wording is an expansion of that: you may want dates who are multi-gender-friendly whether or not you identify that way. Our tour guide was being cagey. Here we were at the first stop: the King and Spadina branch of Soma, perhaps Toronto’s best-known chocolatier. But she was keeping quiet about where we’d be going next. If we were up for it, she said, we’d hit all seven stops on her list, then hang out in Trinity-Bellwoods Park – in a caffeinated, diabetic haze by then, most likely. We hit all seven stops. At Soma the thing to get was (according to our guide) the pine-flavoured truffles, shaped like little elongated tree-pyramids. But it was hard to go wrong there, and my partner and I instead opted for basil-blueberry gelato. A lovely start to a hot summer afternoon. Our group wandered through Graffiti Alley behind Queen Street, surveying the explosively colourful murals, then re-emerged near the macaron shop Butter Avenue. There was lots of excited foodie talk during our ramble, and food for thought as well. A few gay men talked about discovering the poly community, and about the differences in how nonmonogamy is practiced in the gay vs poly communities. I’ve rarely come away from a Poly Toronto meetup, even casual social events, without something to think about, and this was no exception. You may ask: how much sugar can you sanely consume in one afternoon? Well, we did try to pace ourselves. Several fellow crawlers stashed chocolate in their bags, and crossed fingers it wouldn’t melt. Attrition occurred as people headed off elsewhere, but we were still a hardy little band by the end. By the time we reached Sweet Olenka’s, my partner and I still had room for vegan (coconut-milk) birthday-cake ice cream. Our last stop was Bang Bang, on Ossington, but it was mobbed by ice-cream sandwich fans on this hot day—so we skipped it and doubled back to Trinity-Bellwoods. Somewhere behind us was a second group of chocolate-crawlers, who’d assembled at Soma slightly later with a second tour guide. Eventually they caught up with us, and the afternoon ended with the remnants of both groups seated companionably on the green, chatting and watching the local tightrope-walkers practice their art just a foot above the grass. Unknown destinations, flexible routes and multiple pathways, constant checking-in and rethinking and dialogue…yes, I could turn the afternoon into a fanciful metaphor for polyamory. But let’s not get carried away. My thanks to Poly Toronto for putting this event together: I’m certainly game for heading wherever our guides take us next. When you begin the journey into non-monogamy, you may be curious how you find the relationships you are looking for. There are so many variations of relationship style, sexual preference, age range, and boundaries before we even get to that magical unquantifiable ingredient – often labelled as Chemistry. Now the way that meeting prospective partners often works is that you discover the chemistry and then later find out if the person is a match in other ways. So what if you tried this in reverse? 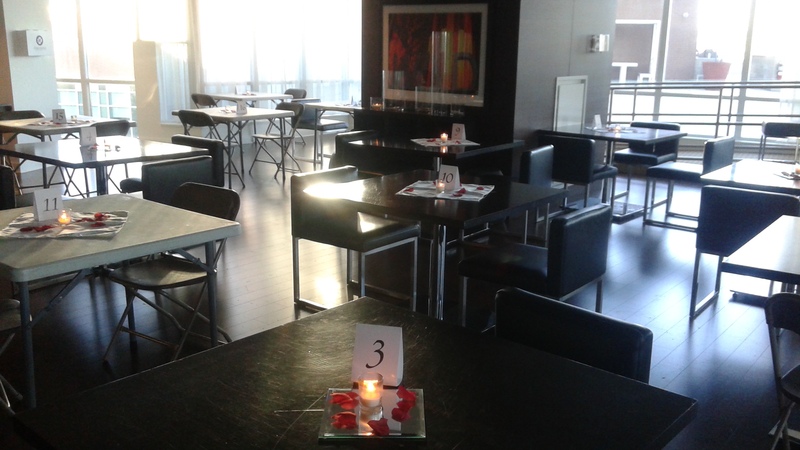 Polyamory Toronto held our first ever Polyam Speed Dating (PSD) event at the party room of the condo building of one of our members. It was a Potluck BYOB event which also led to a wonderful evening of excess as well as success. We were using the polyspeeddating.com web software. This has been running successfully in the USA and the UK, and helped us organize a social event where people met a number of potential dating partners. The event took into account gender preferences, individual/group dating preference, age range preferences, level of kink preferences, and welcomed all (a)sexual orientations and genders. This event felt like a unique success. Most people I spoke to expressed a genuine sense of satisfaction and relief in how easy the process was and how supportive the room was. Apprehensions and awkwardness were lifted mostly because we had a common thematic language to assist in breaking the ice which turned the idea of speed “dating” into something much more positive, effective and focused. Thanks must be given to the organizers for putting together an event with staggering logistics. By all appearances it came together flawlessly. When you take chemistry out of the dating selection, things happen that wouldn’t normally happen. We are all to a greater or lesser extent visually judgemental daters. We seek what our eyes delight upon. PSD does not consider height weight hair colour or any other visual cues, age notwithstanding. Participants may have got a little outside their normal screening procedure. After the dating there was a mingle. People kept on dating. The chemistry effect had shown up. Any polyam social event is essentially an excuse to mix and mingle and make new friends. Instead of being an ordeal it became a party. Everyone bonded from the experience. There was an expressed desire to hold this again every six months and I perceive this is the valedictory message for our first PSD event. I find symbolism for my life in some of the strangest places sometimes. Today it was in my kitchen, specifically my cutlery drawer as I was unloading my dishwasher. I have my main cutlery drawer and what I like to call my support cutlery drawer. The main one holds the spoons, forks, knives and some other odds and ends that get used regularly like a pair of scissors and the can/bottle opener. The support drawer is the place for all my cooking and baking utensils — the wooden spoons, slotted spoons, different sized whisks, measuring cups, etc. It dawned on me this afternoon that my life and relationships could be compared and organized in very much the same fashion. In my main cutlery drawer, there is a container which has 6 slots — one for small forks, big forks, small spoons & big spoons, one for butter knives and a small compartment at the top for odds and ends. This container is like a corner of my life. And the drawers represent the time and space I have for interactions. I have forks in my life and I have spoons in my life; people I interact with on a regular basis that help me in important ways. I have a really sharp-witted friend that could be represented by the scissors. I have another person that can be compared to the slotted spoon — ready to help me pick up what’s necessary and leave the rest behind. Some people are a combination of these tools. Some only represent one. Both drawers and their contents are important in different ways. The point for me is that a relationship structure such as polyamory allows me the space to have all of these different types of people in my life without limiting me to use just one spoon for the rest of my life. Or having access to a fork but only being able to utilize it in the “correct” way. So what if I use a fork to spread my peanut butter? So what if I improvise and use the butter knife to mix something instead of the whisk? So What! Sometimes I forget and I put the rolling pin from the support drawer into the main cutlery drawer. I catch this right away — it sticks out, it doesn’t fit. I’m trying to make it something it’s not. Some relationships are like that. It doesn’t mean I don’t want or need a rolling pin. I just don’t want it to take up so much space in my main drawer. It doesn’t allow things to flow the way I like or desire. And unfortunately some of my favourite tools/implements get worn out from plain wear and tear or right out neglect. Sometimes there’s not enough space in either drawer for it anymore and we must part ways. It happens. It’s one of the constants of life. But when something changes, it leaves space for new experiences. New experiences that don’t negate the memories. In fact new experiences can often provide perspective to look back on the memories with a new fondess and reflection. Ultimately what matters is that I am nourished and valued and those in my life feel nourished and valued. So as I complete the seemingly mundane task of putting my dishes away, I’m reflective of all the forks, spoons, scissors and can openers I have in my life. I’m reflective of the super cool electric can opener I owned eons ago that was awesome to use but whose motor burnt out after only a year — not very dependable really despite all the bells and whistles it promised. The pay out to get it fixed also out weighed the benefits and so I let it go. In the end, we’re all just looking for our place in the world and in the lives of the people we care for. It warms my heart to know I’m someone’s spoon or fork. And yes, even to know I was once someone’s fancy electric can opener, if only for a little while. I have a strong belief in non-monogamy and multiple deeply committed relationships. That’s what makes me Polyamorous. For me, it manifests in a form that is often referred to as Solo-polyamory although a more accurate description for myself would be the Relationship Anarchy identity. The details differ from person to person and this is an account of my Solo-polyamory journey. I prescribe to a non-hierarchal, non-conforming way of life overall … this isn’t just specific to my romantic relationships. I treat each interaction as individual and don’t allow typical mainstream pressure to dictate who ‘should’ be important to me versus who is actually important and reliable based upon behaviour. This comes after having an unstable family of origin upbringing and being raised with very unhealthy boundary messages that I‘ve had to unlearn. This is another subject all together and will probably pop up in writings in the future. There are components of my behaviour that are specific to polyamory overall. Such things as challenging the heteronormative monogamous status quo, my desire for variety in emotional, physical and sexual intimacy, the joy of having a diverse and colourful emotional support network, the joy derived from voyeurism and feeling compersion. And then there are components that are specific to Solo Polyamory that not all poly-identified people can relate to. They can be observed in my views on economics, co-habitation and commitment, how I wish to challenge the poly-normative model, my desire for healthy relationships versus relationships of longevity, compatibility and my level of risk assessment and finally how strongly I value autonomy, self-care, introversion and solitude. Since I wanted to write about Solo Polyamory, I won’t focus too much on the broader poly elements but I thought it was still important for me to elaborate on each point a bit. I was taught that there was a hierarchy to all relationships (parental, familial, friendships and romantic). Conversations with many people over the years tells me a great deal of us were taught similar notions and they circulate around what is known as The Relationship Escalator. Blogger Aggie addresses the issue perfectly and I have no desire to reinvent the wheel. If you’re interested in learning more about the relationship escalator and default scripts, please read her writings. The desire to NOT ride the relationship escalator means that my relationships appear to be non-progressional in the typical landmark types of ways. Having an attraction to all gender identities also drives my desire for a variety of different experiences with different people. Monogamy just doesn’t leave room for me to explore my sexuality in the ways I want to. Longevity does not equal quality or depth. Longevity does not validate a connection or qualify love. Longevity only equates ones ability to be persistent and loyal to a cause and humans have this knack of staying in their comfort zones, staying loyal to stability out of fear and not challenging the norms of their lives so they don’t ripple the calm waters. Humans often wear rose-coloured glasses, seeing what we want to see and not dealing with the reality of unhealthy situations. Longevity is not my goal in a relationship. It is a side effect of a healthy interaction. As long as interactions remain healthy, I’ll be very willing to maintain them. Constants “for life” are a rarity so I question why we base our love, interactions and financial stability upon this premise? My preference is to leave room for change and contradiction. Personal emotional growth will often look like a contradiction. I will abandon a belief I wholeheartedly stood behind when I have a change of perspective. My experiences often change my views … sometimes by re-affirming them, sometimes by invalidating them. When there is room left in a relationship to communicate these changes, it just leads to a healthier dynamic overall. Countless times I have had people confide in me that they were too scared to talk to their partner because they made a specific commitment and now no longer possess the ability or want to carry it forward. Fear paralyzes us. But I would rather a partner have the courage to be truthful to themselves and me, even if this means the end of the relationship as we know it. Because of this, my commitments and promises are usually based on a specific situation, time frame or left open to further negotiation. Life time commitments just aren’t in my vocabulary with the exception of offering life time support to my children. From a very early age, I relished in watching others experience life. And while voyeurism is usually attached to some form of sexualization, I take great joy in people watching overall and specifically when these are people I love and care for. It’s the feeling I get when I watch a friend succeed in a lifelong dream, it’s the feeling I get when I watch my goalie son get 3 shutouts in a row, it’s the feeling I get when I see my overworked father finally considering retirement. For me, it just happens to also include watching my partners fall in love, hearing the joy another human being has brought to my lovers life and watching my partners be physically consumed with desire for another person. So you know when people say you only truly know something’s not right for you unless you actually try it? While I normally think this line of thinking is hogwash and have no desire to validate myself for the comfort of others, I’m going to jump on this ship for a brief moment. So how do I know monogamy isn’t for me? Because I tried it and I tried it for a very long portion of my life, 14 years collectively. And I tried it with three different people, three different set of characters and personalities; it wasn‘t them, it was me. For me, monogamy was like being encased in a glass box with my partner. It appeared to be comfortable and stable. It appeared to be a great foundation to build from. But it was also tremendously limiting, suffocating and was slowing killing my soul. I tried so very hard to ‘fit in’ to the script I had been given and it just wasn’t my path so I decided to write my own. The freedom and variety of experiences polyamory brings to my life floods over in amazing ways … my creativity has been increased, my work ethic was always strong but it has deepened, my overall life fulfillment his multiplied. My emotional support landscape is a beautiful workable art piece built with people who are willing and able to engage with me, not out of some level of obligation that’s been scripted to them but out of a true desire to want to! I am surrounded by people who choose to exercise self care first which gives me great confidence and faith in knowing their actions are genuine. What follows now are the distinct unique features that can be labelled as Solo Polyamory and they are very specific to me and how I relate to people. The Primary Partnership role models I have been presented with, both in real life form and in media presentation often (not always) follow a similar format. For simplicity’s sake, I’ll divulge what my definition of primary looks like. I can appreciate this isn’t everyone’s definition. For me, engaging in a primary relationship often looks like two people, a pairing, living together, sometimes legally married, often with children, owning property together and financially entangled. The commitment is seen as a long-term thing and legally binding. They could ‘pass’ as a monogamous couple and often do to their family, friends and business associates who are often unaware of their poly-identity. For me, the Primary Partnership structure feels far too similar to monogamy for me to find fulfillment within it. It feels like polyamory done by monogamy’s rules and restrictions. For me, it is a breeding zone for possession, control and co-dependence if not monitored consciously. Possession does not equal ownership. To label one relationship Primary leaves room for all other relationships to feel deficient and incapable of reaching a level of importance. It creates competition to an already challenging relationship style. Naming one relationship primary in my life seems so demoralizing to all of the other relationships I’ll engage in, simply because my relationships are based in emotion and enjoyment of someone’s company and not tangible basic needs like cohabitating, co-parenting or ownership of property. My level of commitment is based on upholding the integrity of the connection through trust and attentive behaviour. I can’t quantify these qualities by assigning them a level of importance. They’re all important in different ways, not in more/less ways. And while I can’t possibly treat all of my partners equally (it’s just not possible), my aim from the get-go was to attempt to be fair. To communicate honestly about my feelings and emotions and what I wanted my life to look like. I have no desire to chain myself to my favourite human. A consistent theme of the Relationship Escalator is the benchmark of financial entanglement and co-habitation. Again, I’ve been through this three separate times and every time, it became an unhealthy element in my relationships. I have an unhealthy relationship with money and specifically when it relates to an exchange between loved ones. This is strongly due to my childhood relationship with my mother who tried to buy my love and acceptance but offered very little in the way of emotional support or positive physical attention. My mother would buy me things and then use them against me in an attempt to control and influence me. It’s very difficult to say no to someone when they wield this type of power. Until I feel I have dealt with this baggage, I consciously choose not to engage in this type of interaction. Because of the above, I do not enjoy being financially responsible for anyone’s needs other than myself and my children. On the flip side of that, I don’t derive any level of enjoyment from having someone care for me financially. In fact, it has quite the opposite affect leaving me feeling inadequate, guilty and shameful for not being able to stand on my own two feet. And I’m not talking about gifts or dinner. I’m talking about paying for the roof over my head or my share of the bills. There are always exceptions to the rule and emergencies in which I must lean on my friends/partners, but in an ongoing day to day basis, I want to maintain my financial independence and know I can take care of my basic needs with or without a romantic relationship. A relationship should not be a person’s source of income or financial stability — not a primary source and for me, not even as a secondary source. I have no desire to make love, emotions and relating into a business. Mixing economic needs with relating/emotional needs ensures an instability within the relationship structure and creates an ongoing imbalance for me. It creates a ‘scorecard’ dynamic that I’m not interested in. It can lead to the inability to walk away from an unhealthy relationship because of financial dependence. I’ve been on both sides of this coin. I’ve wanted to leave a relationship but was unable to because I couldn’t afford to and that truly sucked. I also left my husband of 10 years who made significantly less than I did and that created a lot of guilt and shame. His quality of life was directly linked to financial dependence on me and this changed when I left. Does this mean I’ll never live with one of my partners ever again? No, it doesn’t. But my ideals around co-habitation are significantly different than most people I’ve interacted with. Firstly is the issue of compatibility. While I truly enjoy the company of a lot of people, this doesn’t mean that we’re compatible to live with one another. That is a separate beast all together! Just go away for a weekend with some of your friends or have your family stay over at your place for a week and I assure you, you’ll know exactly what I mean. Does this mean your friendship or family bond isn’t strong? No, not at all. Even the strongest of relationships have difficulty standing up to the magnification of personalities when living in close quarters for an extended period of time. So while I connect with many people on a deep and satisfying level, not all of these people are compatible living mates and I don’t wish to put this level of stain on them. The benefits just don’t balance with the risk. I also value myself too much to compromise my needs. And along with compatibility is the fact that I’m an introvert and I not only enjoy my solitude … I need it. I need it like food and water. And I am fierce about how I obtain this solitude daily. My boundaries are strong and I would need live-in partners who respected this need. What I’ve encountered is that it is far too convenient for my partners to interrupt my solitude while we are cohabitating. Live-in situations are too intrusive for me. Having physical separation ensures my ability to meet my needs on a regular basis. As Reid Mihalko says here about Dating Your Species, I’ve found it difficult to find someone compatible with my intense need for space. The ways in which we label ourselves can be quite in depth and complex. I find more so when we’re living through alternative models. It has taken me a number of years to be comfortable with my solo-poly identity but taking the time to gain the confidence to own my solo-ness was time I needed to take. I truly could not see myself living any other way and while I may receive criticism or right out disapproval from many, I’m satisfied and secure enough to know I’m making the best decisions for me for right now. Since I am a walking contradiction open to emotional growth, ask me again in a year if I still hold these beliefs. I may just surprise you. ** Many people ask me why I use the term solo versus single. My answer is simply because in our current culture, single is known to mean “alone and currently looking for the one” whereas solo is a respected version of individualism. A solo act, in music or theatre for example, is looked upon as difficult to pull off but applauded when delicately executed. I know living solo-ly is a more complex choice but I’d like to think I’m executing it with grace and decorum. Happy International Women’s Day and Happy 3rd Anniversary to Polyamory Toronto!! It is a hot time for Polyamory Toronto! The start of 2014 has rejuvenated people’s energy and commitment to themselves and their happiness. As a community, I am proud to see people flourish and expand their horizons! As I reflect on the past year, I can’t help but turn to the numbers … the numbers don’t lie. This time last year, we were celebrating having 500 members and a regular line up of events that were well participated in. This year, we added a growth of over 300 new members. Some have stayed with us, some have taken what they needed while passing through. Nonetheless, the message of loving more than one is being heard loud and clear! And our events are growing ever popular. There has been some exciting chatter around the table at our Group Planning meetings. Our vision of serving the Southern Ontario community has stretched to more national and worldwide possibilities. Of course our heart and soul will always be dedicated to the grassroots of our local community and our local events but the options presented to us are intriguing. Firstly, we’ve been focusing some of our attentions in reaching more people, in sharing that polyamory is a viable relationship structure and option. We successfully launched our website which will assist in getting our message out there. We’re especially proud of the blogging area and the prospects that will come from it. If you haven’t already taken a peek around, please take some time to do so. And if you have any recommendations for content, our community leaders welcome your feedback. Having this public identity has enabled us greater freedom in reaching more people than our private meetup group currently allows. It’s a win, win overall. Rest assured though that our meetup group will remain private and there are still procedures in place before someone gains access to private event information. Secondly, we’ve been engaging in conversations with community leaders in other areas and these conversations have presented us with some pretty interesting projects. Samantha Fraser of Not Your Mother’s Playground has often been an ally to this community and we’re looking to strengthen this relationship by directly contributing polyamory-specific content to her annual Playground conference in November. Look for further information on this in the coming weeks and months. It’s a big task but one we’re eager to take on. We’ve also established an ongoing relationship with members of the Canadian Polyamory Advocacy Association (CPAA). While the CPAA is primarily located in the west of Canada, it is an organization that is dedicated to Canada as a whole. Board members are interested in having more cross-national members and input. The CPAA successfully held their first PolyCon in Vancouver in 2013. They have now opened up the possibilities of having future PolyCon’s throughout the country. Polyamory Toronto is interested in hosting an event of this stature in the future; hopefully in 2015. We will be submitting our proposal in the next few months. Other cities that are contenders are Vancouver and Montreal. This would be a tremendous undertaking and one that carries a great deal of risk. Our leadership team would be looking to our membership for various forms of support (volunteering, content, fundraising, etc). In saying all that, we’re are still very optimistic that Polyamory Toronto and Toronto in general could promote and host a successful PolyCon! On behalf of the Community Leadership contributors, I’d like to say thank you for your efforts and participation in making Polyamory Toronto what it is today. The journey has been a challenging but fulfilling one for most of us. We look forward to celebrating on Tuesday at our Anniversary event with those who can attend. The latest online game to sweep across my social circle is The Candy Crush Saga and it recently celebrated its one year anniversary. I avoided it for a long time; simple lack of extra energy and stubbornness to not get swept into what everyone else was doing. But the comments I heard here and there got to me and so one day, I added the app on my phone. The rest is history and so the lessons began …. The polyamorous way of life can be challenging at times. It can create moments of tunnel vision; especially in less than successful moments. Keeping with the thought that love is infinite, so is life and its numerous possibilities. The way you have chosen to weave your love life is an intricate puzzle with many pieces of sweetness forming its whole. In addition to the pieces of the puzzle that you can currently see, there lies other sweet pieces on the outside edge waiting to fall into place. Leave your heart open to the possibilities that you can’t even consider in this moment. Small changes over a long period of time often leaves room for monumental pieces to enter the picture later down the road; making room for bigger changes to take shape. These changes may open up worlds of possibilities or they may stump you a little as you step back to figure out what the next move should be. At the end of the day, we’re all on an individual adventure, where the focus is on a collective of small moves — not just one big one. Remember that everyone starts somewhere. While polyamory as a concept may be easy for you to wrap your head around, we still live out our lives in a society that breeds judgement in the face of change. You will meet many people who will challenge your belief in this way of living and loving. Taking baby steps and devouring the plethora of information available will assist in meeting those challenges with confidence. There are going to be some levels in this game that seem harder than others; this is ok. Our ability to love many may come natural but the strength of our relating tools may need some fine tuning when navigating multiple relationships. Most humans did not come equipped with the skills or strategies to overcome the multitude of obstacles faced when taking on any meaningful intimate relationship. We need to unlearn old, ineffective ways of relating in order to build healthy, reliable skill sets. We need to unwire our hardwiring from our early role models. This is not an easy task. Picture these skills sets like tool boxes — we are given basic tools of relating at the beginning — a hammer, screwdriver and a wrench. Some people are only given 1 or 2 of these tools; others may be given a variety of each type — Carpenter’s hammer, Sledge hammer, Gavel, Mallet, Phillips screwdriver, Robertson screwdriver, Flat head, Open-end wrench, Adjustable wrench, Monkey Wrench, Ratchet Wrench or a simple Allen Key. The varieties are endless. As we grow and interact with others in the world, we learn to perfect our relating style with the tools we’re given. Practice turns newly learned skills into effortless habit. And just as we sometimes hit our thumb the first few times swinging a hammer, emotionally we will gauge, take appropriate aim and still manage to hurt others. This is life, this is love and this is learning. Try to minimize the frequency and depth of the hurt but accept that it may happen even when we don’t want it to. Along with multiple relationships comes a multiplied risk of pain but there is also the multiplied rewards of love which are oh so sweet. Enter each interaction genuinely and authentically, willing to learn and love. The hurt may still occur but the blow may be lessened when you approach with an honest heart. It may feel like you’re the only one stuck on level 55. Everyone has surpassed you and you tell yourself that it’s you — you’re not capable of passing this level. But then you meet someone who is stuck on level 33 and you remember how difficult that lesson was — it took you five tries! We’re not all at the same places at the same time. We don’t all have the same insecurities to work on. Those tools we’re equipped with — well some people have had opportunities to trade in their older tools for newer, more efficient ones. Some people replaced their hammer with a shiny new nail gun or their Phillips screwdriver with an adjustable screwdriver set with a selection of multiple bits. It’s hard not to be envious but if you want a nail gun too, you have the power to make that a reality by recognizing the right opportunities and making a commitment to doing some hard work. Polyamorous loving is not a competition with others. We each have our own paths to walk. When you come across people who are where you’d like to be, chose to see them as an ally and not the competition our early roots have taught us. Oh and when you come across someone who is loving in ways you can’t even fathom … leave them be! Live and let live. Repeat after me: Your poly isn’t my poly but your poly is still valid! Leave the judgements for those who have nothing better to do. Concentrate on loving more. You’ve hit a wall, you just can’t figure it out. You’re wasting time, energy and valuable life over and over again. It’s time to visit your neighbours tool box! Our friends and family are our support lines to happiness and success. They can help in many different ways, even if they’re not polyamorous — by offering advice on how they overcame the level, by sharing their valuable energy with you or providing a much needed distraction when you require a refocus. Never underestimate the benefits others can bring to your game. Following the game principle, a match of three is great to eliminate small obstables but wonderful things can occur when we match up four or five pieces of sweetness. We’re all connected and as independent as we all want to be, we all need help from time to time. Ok, here’s your dose of tough love. If your game; the triumphs and difficulties of your game, are all you can talk about, you’re going to find yourself alone and fast. Realize that there are endless games to choose from and not everyone is playing the same version or variety as you. Now that you’ve discovered this utopia that is loving more than one, don’t be a jerk! Being polyamorous does not entitle you to criticize the relationship choices of others. There are still many valid options under the huge umbrella of relationship styles. Swingers are not dirty. Monogamist are not lost souls needing conversion. The couple who are monogamish are not wrong. Just as it is unacceptable to tell someone their sexual orientation isn’t valid because they haven’t tried ALL the options, it isn’t acceptable to bully people into polyamory. Keeping an open mind means just that. Once in a while, ask someone about the types of games they like to play and how this contributes to their overall enjoyment. You might just learn a thing or two. So you learned a new way to cut some corners, to cut out the waiting game to recharge. Your energy is replenished right away and you feel invincible! Nothing can stop you now. You’re engaged in your game ALL. THE. TIME. Well, there’s a price to that immediate gratification. The pressure to always be actively playing wears thin. You become cranky as your frustrations are exemplified and you become egotistical as your triumphs occur at stupendous velocity. You speed through levels but are you really absorbing all the joy, lessons and skill sets at this pace? Patience is a virtue for a reason. When you first learn about polyamory and find a great community of like-minded people, it can be really tempting to not take the time to do the homework. You want to rush out into the world and date all the people! Because, you know, you’re poly and you can do that, right? Wrong! Polyamory is not a game of quantity. Two fulfilling, whole relationships will always be better than ten mediocre half connections. Dedicating some time to yourself for inner introspection is just as valid! No one can revoke your poly card based on your active number of relationships. You’re polyamorous because you feel it in your heart, not because of the number of partners you have. More is merrier but more doesn’t equal any and all. Be selective; Polyamory is not Pokemon. While we’re not aiming for perfection, it’s valuable to take a step back, look at the entire map and see where you’ve been. There are some levels you passed right away but you passed with only one or two stars. There are some levels you struggled with for days and weeks that you were grateful to pass with that one star. Re-evaluate. You may have acquired the skill sets and tools to turn those one star achievements into two or three star achievements. Perfection isn’t the goal, but challenging ourselves to be better is. Sometimes it’s worthwhile to retest yourself with an old situation to reinforce how far you’ve come. With polyamory, there is no rush to scoop up ‘the one’ when you come across them. Or to jump into a situation you’re not quite ready for. Timing can be everything when it comes to fruitful interactions. That cute barista you had a crush on a few months but never acted on, now may be a great time to see if there’s something worth percolating. You’re working away, making baby step after baby step — removing obstacles three red jelly beans at a time. Then it happens; you make a seemingly insignificant move that allows the space for a yellow lemon drop to turn into a striped candy which activates a blue lollipop head to turn into a wrapped candy. When that blue wrapped candy explodes, a pretty purple cluster falls between 4 other pretty purple clusters to create the ultimate obstacle busting tool — the Chocolate Ball coated in Sprinkles! Exchange this decadent chocolate with a striped candy and be prepared to witness your picture frame radically change for the better. Take the time to watch old obstacles melt away into the background, feel the sense of accomplishment and relish in the idea of a new different looking horizon. Give yourself permission to celebrate arriving in a place that seemed so far off only a short time ago. You may feel like shouting from the roof tops when this occurs. Go ahead, do it! It’s ok. Be your own Cheerleader and share with whomever you can. We love hearing other people’s happy poly moments. You need to take a break and recharge your energy. Sometimes this game becomes far too exhausting and you need to shut it off/shut it out to gain perspective. Sometimes You’re Not Ready For This Jelly! Being continually open to relationships and love means experiencing a ton of emotions and processing on a regular basis. Even when your relationships are going well and others consider you to be ‘successful’ at being poly, you still may need to put self care first. Poly saturation is a very real phenomena. I use to say that time was our only limitation to the number of people we could love. I now know this to be energy instead of time. My energy tank must be refilled often and in a variety of ways in order for me to be at my prime. If my self care is suffering, I’m going to be cranky and in turn, my partners are going to be cranky too. Take a bath, have a tea, go for a walk, laugh, remember that you are a person outside of your relationships . We don’t have forever here — the bigger picture game ends for everyone at some point. Sometimes all too soon. Enjoy it while you can. There are only so many moves we can make. Make them count. If you’re lucky, you will have a few moves left over and your game will end with the colourful dance of the gummy fish. Anyone that knows me, knows I love Milk Chocolate. And some things, like New Relationship Energy, can be addicting like Milk Chocolate. But this, too, needs to have its limits of moderation. If you over indulge in the sweet Milk Chocolate and let it overtake your life, it spreads until there’s no room to make the moves needed to grow. It can cloud your judgement. Welcome to the Polyamory Toronto website. A place built by the community for the community of like-minded pioneering social activists. Monogamy is not for everyone. If you want to love more than one other, if you can allow the ones you love have other loves, if all your adult relationships are honest and consensual, then welcome to the culture of Polyamory.